Do you have spirit? 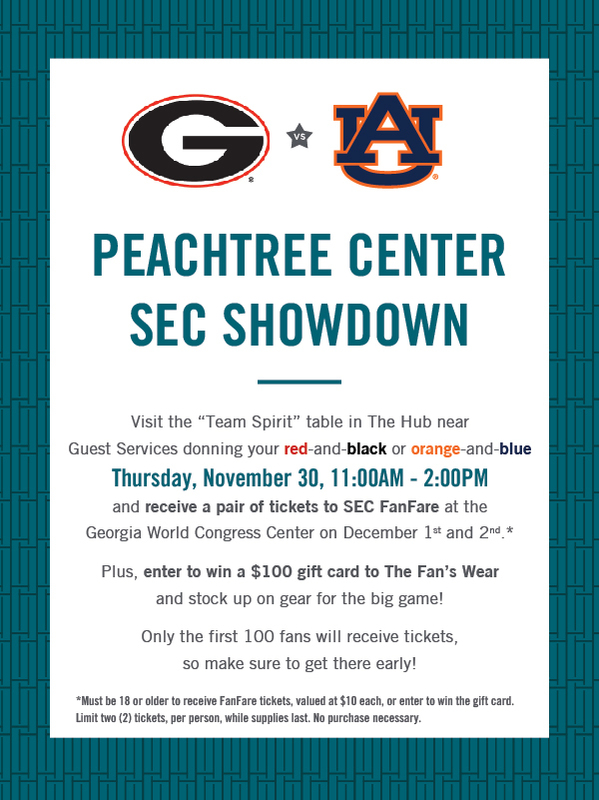 Peachtree Center wants you to don your red-and-black or orange-and-blue best on Thursday, Nov. 30 and head to the “Team Spirit” table at The Hub for a chance to receive a pair of tickets to SEC FanFare at the Georgia World Congress Center on Dec. 1 and Dec 2. The SEC FanFare is a can’t-miss event with pep rallies for both Auburn University and the University of Georgia, along with live broadcasts on SEC Network, games and interactive attractions, meet and greets with star players and more. Championship action awaits you at SEC FanFare! In addition, participants can enter to win an $100 gift card to The Fan’s Wear and stock up on gear for the big game! Only the first 100 fans will receive tickets so make sure to get there early! *Must be 18 or older to receive FanFare tickets, valued at $10 each, or enter to win the gift card. Limit two (2) tickets, per person, while supplies last. No purchase necessary.